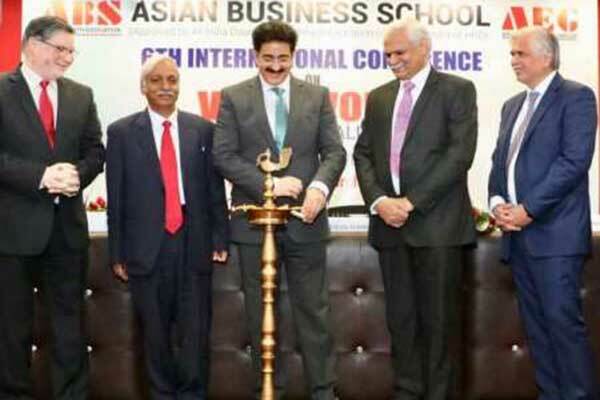 Noida: Sixth International conference on Issues and Challenges of VUCA was organized by Asian Business School at Marwah Studios Complex to bring in awareness among the students. Large number of speakers from all over India expressed themselves on the subject and discussed many personal and official issues in detail to overcome business problems through case studies. Prof Dr Rakesh K. Khandal, Richard Rekhy, Dilip Chenoy along with Dr. Sandeep Marwah, Dr. Lalitya Srivastava inaugurated the full day sessions. “These elements present the context in which organizations view their current and future state. They present boundaries for planning and policy management. They come together in ways that either confound decisions or sharpen the capacity to look ahead, plan ahead and move ahead. VUCA sets the stage for managing and leading. But the fact is that strong determination can overcome all the hindrances,” said Dr. Sandeep Marwah Chancellor of AAFT University of Media And Arts. Prof. Sudhir K. Jain Professor and Ex-Head- Department of Management Studies, IIT Delhi, Muniinder Anand (Managing Director-India and South Asia – Centre for Creative Leadership), Charandeep David Head – L&D OYO Rooms and Prof. Kartik Dave (Professor & Dean School of Business, Public Policy & Social Entrepreneurship Ambedkar University, New Delhi were the distinguished personas for the occasion. VUCA is an acronym — to describe or to reflect on the volatility, uncertainty, complexity and ambiguity of general conditions and situations; drawing on the leadership theories of Warren Bennis and Burt Nanus.